If you own an iPad 2, which many readers do, we think you need a photo-editing app to at least try and make iPad-taken snaps look a little better. Attempting to keep the large frame of the iPad 2 steady for a decent shot is part of the challenge, but the fact that it produces sub-1MP photos doesn't help matters, especially if you're planning on transferring the shots to a larger screen where the photo-quality inefficiencies are all too plain to see. 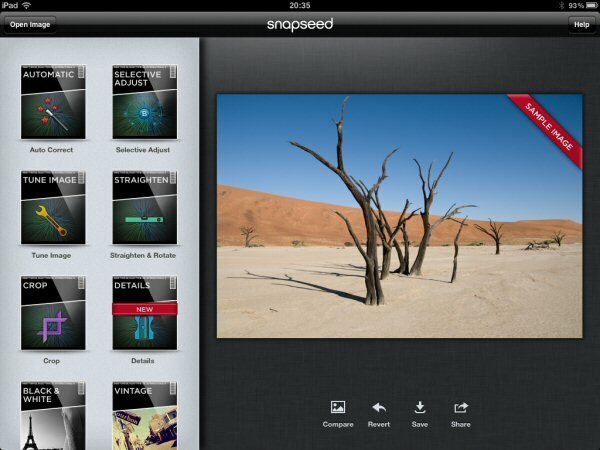 Though many photo-editing apps currently available on iPad won't replace a professional photo-editing suite due to limited functionality, we have found one of the better ones to be Snapseed, which is currently available to purchase for £2.99 and offers a host of options that are fun to use and, most importantly, do a good job at jazzing up your images. The developer behind the app is Nik Software, who already has some expertise in the photography field having created a bunch of plug-ins for Adobe Photoshop, including Color Efex Pro 4 and Sharpener Pro 3.0. And, despite some of the obvious shortcomings here compared to a full package, its expertise shows with an intuitive-to-navigate, well-laid out interface that comes complete with a significant number of editing options, as well as the ability to print and email your shots, or upload them directly to some of the popular social-networking sites. The main screen of Snapseed is split into two, with three quarters of the page taken up by the chosen photo and the remaining part showing the various tools one can use to adjust the snap. In the top left-hand corner you can open an image from those available in your gallery, or take a live shot that will upload automatically. Once the photo is on screen, editing begins in earnest. There are 13 main options available to edit a photo, and the first five enable image adjustment and fine-tuning. - Auto Correct: Automatically analyses a photo and adjusts color and exposure. - Selective Adjustment: Tap an area in the photo and swipe side-to-side to adjust. - Tune Image: Use 'Ambience' to create depth and vibrancy that uniquely adapts to colors and textures. Adjust White Balance, Saturation, Contrast, and more. - Straighten: Rotate 90° and/or straighten photos with simple gesture controls. - Crop: Easily crop photos to remove distracting parts.